SUBFAMILY Epidendroideae, TRIBE Vandeae, SUBTRIBE Sarcanthinae. 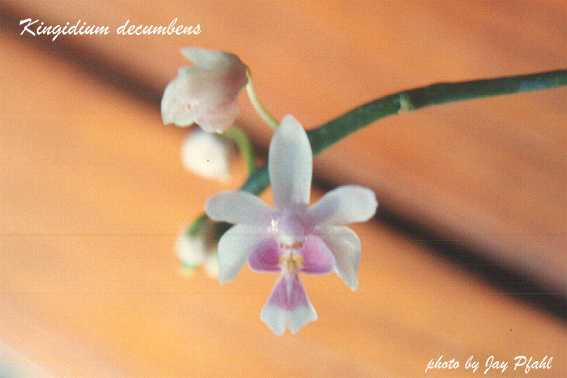 This genus is composed of 5 species found throughout tropical Asia and are very similar to Phalenopsis in culture and in appearance. They differ from Phalenopsis by having a sacate lip and they need to stay wetter in cultivation as they cannot store much as they have no psuedobulbs. There are leafless varieties of Kingidium and these must be slab mounted as to allow the phytosynthetic roots to get sun. This genus likes intermediate light and regular year round water and fertilizer. The genus was described by Hunt in 1970 as it was formerly known as Kingiella.